The global cardiac marker testing market is projected to reach USD 3.50 Billion by 2021, at a CAGR of 8.8% in the forecast period (2016–2021). Factors such as growing incidences of cardiovascular diseases, the rapidly increasing geriatric population, growing funding from public–private organizations for research on cardiac biomarkers, and ongoing clinical trials for the identification of novel cardiac biomarkers are driving the growth of the market. However, factors such as technical problems related to sample collection and storage and issues related to regulatory and reimbursement systems are some of the key factors hampering the growth of this market. Emerging markets, including India and China, have become attractive destinations for companies engaged in the development and marketing of cardiac biomarkers. Rising prevalence and incidence of cardiovascular diseases is among the major driving factors for the growth of this market in China and India. For instance, annual cardiovascular events in China were projected to increase by more than 50% from 2010 to 2030. China has one of the highest CVD death rates in the world and it is estimated that one in 5 adults in China has a cardiovascular disease (Source: American Heart Association). In addition to this, public–private initiatives to increase awareness related to early cardiac disease diagnosis in patients and physicians and increasing knowledge about technological advancements among lab professionals and cardiologists due to ongoing conferences and seminars are the key factors propelling the demand for cardiac biomarkers in the emerging markets. As of 2016, Roche Diagnostics (Switzerland), Abbott Laboratories (U.S.), and Siemens AG (Germany) held the leadership position in the global cardiac marker testing market. In the past three years, these companies adopted product launches, product showcase, agreements, and partnerships as their key business strategies to ensure market dominance. Danaher Corporation (U.S.) Alere, Inc. (U.S.), bioMérieux SA (France), LSI Medience Corporation (Japan), Ortho Clinical Diagnostics (U.S.), Randox laboratories Ltd (U.K.), and Guangzhou Wondfo Biotech Co., Ltd. (China) are some of the other players in this market. The cardiac marker testing market is expected to reach ~USD 3.50 Billion by 2021 from USD 2.30 Billion in 2016, at a CAGR of 8.8% between 2016 and 2021. Factors such as growing incidences of cardiovascular diseases, the rapidly increasing geriatric population, growing funding from public–private organizations for research on cardiac biomarkers, and ongoing clinical trials for identification of novel cardiac biomarkers are propelling the growth of the global market. However, technical problems related to sample collection and storage and issues related to regulatory and reimburse systems are some of the major factors restraining the growth of this market. On the basis of type, the global cardiac marker testing market is segmented into troponin I and T, CK-MB, BNP or NT-proBNP, Myoglobin, hsCRP, and other biomarkers. The other biomarkers segment comprises galectin-3, H-FABP, myeloperoxidase, ischemia-modified albumin, and homocysteine. The troponin I and T segment is expected to grow at the highest CAGR owing to the high sensitivity and specificity, longer elevation time, and rapid prediction of outcomes or mortality. On the basis of product, the global market has been divided into two segments, namely, reagents and kits and instruments. The instruments section is further segmented on the basis of method, namely, chemiluminescence, immunofluorescence, ELISA, and immunochromatography. The reagents and kits segment is expected to grow at the highest CAGR during the forecast period. Increasing number of cardiac biomarker tests performed due to the growing aging population and burden of cardiovascular diseases, availability of various reagents and kits, and the continuous launch of new, faster, and reliable products is contributing to the high growth of this market segment. The global cardiac marker testing technology market is segmented on the basis of type of testing into laboratory testing and point-of-care testing. The point-of-care testing segment is the fastest-growing segment in this market owing to the advantages offered by it (such as reductions in length of stay, improved emergency department efficiency, increased patient satisfaction and user experience, better turnaround times, and simpler sample collection method versus that in central lab testing), rising hospital point-of-care (POC) testing procedures, and technological advancements with regard to the development of advanced, faster, and easy-to-use devices. Based on disease, the market is segmented into myocardial infarction and congestive heart failure. The myocardial infarction segment is expected to account for the largest share of the global cardiac marker testing market in 2016, and is expected to grow at the highest CAGR during the forecast period. The large share and high growth in this segment can be attributed to the increasing number of patients requiring investigation for diagnosis of acute myocardial infarction in emergency departments compared to other cardiac disorders. 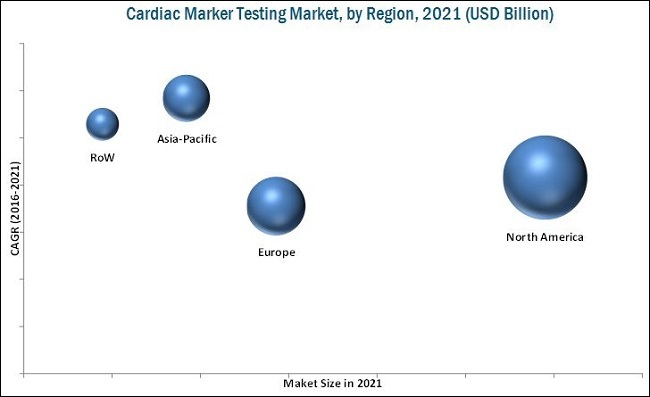 North America is expected to account for the largest share of the global cardiac marker testing market in 2016, followed by Europe and Asia-Pacific. The Asia-Pacific market is expected to register the highest CAGR during the forecast period. The high growth in this segment can be attributed to rising prevalence and incidence of cardiovascular diseases, public–private initiatives to increase awareness related to early cardiac disease diagnosis in patients and physicians, and increasing knowledge about technological advancements among lab professionals and cardiologists due to ongoing conferences and seminars in the region. The cardiac marker testing market is highly competitive owing to the presence of a number of large and small firms. With improving industry standards, the global market has been witnessing several product innovations. New product launches was the key growth strategy adopted by market players to strengthen their market positions. The major players in the global cardiac marker testing market are Roche Diagnostics Ltd. (Switzerland), Abbott Laboratories (U.S.), Siemens AG (Germany), Danaher Corporation (U.S.) Alere, Inc. (U.S.), bioMérieux SA (France), LSI Medience Corporation (a subsidiary of Mitsubishi Chemical Holdings Corporation, Japan), Ortho Clinical Diagnostics (a subsidiary of The Carlyle Group, U.S.), Randox laboratories Ltd (U.K.), and Guangzhou Wondfo Biotech Co., Ltd. (Wondfo) (China). 13.11 Guangzhou Wondfo Biotech Co., Ltd.